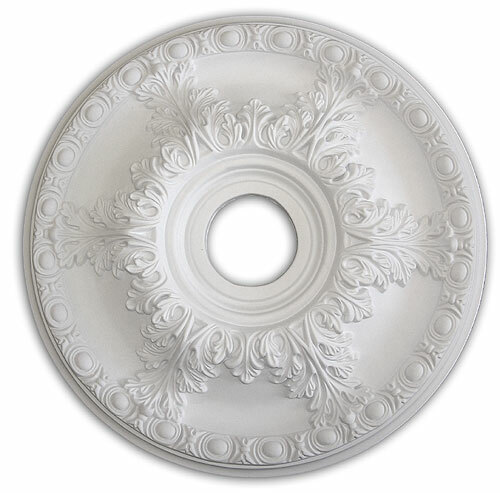 Inner Diameter - 3 5/8"
Ceiling medallions are easy to install. If this is your first installation we have put together this guide to assist you: Step by Step Guide to a Ceiling Medallion Installation. Another option, if you don't want to remove your fan or chandelier, is to install it as a two piece ceiling medallion. Some of the ceiling medallions come with a hole that is precut. For medallions that do not have the hole precut you can easily create one with a drill or hole saw. Get more answers to common questions with our Medallion Frequently Asked Questions. The ceiling medallions are stocked in our Louisville, Kentucky warehouse and normally takes 4-5 business days for delivery to the West Coast, 2-4 business days for delivery to the Central States, and 2-4 business days for delivery to the Eastern Coast. Need a quicker delivery? Call 1-800-419-1130 and we will be happy to assist in getting the materials delivered in time for your project. Custom products do not qualify for a refund if returned. Custom products include, but are not limited to, any item that has been noted or explained as being custom built, as well as, all products that have been requested for modification such as having a hole drilled on ceiling medallions that do not have a preset hole. Any product that has had a logo made or engraved is considered custom and cannot be returned for a refund. For design ideas on how you can finish your ceiling medallion view our Painted Ceiling Medallion Showcase. You may also browse our selection of Prefinished Decorative Medallions or if you need something with a large "wow" factor visit the Michelangelo Ceiling Medallion collection.